This article is about the geographic region. For the university, see Northern Illinois University. For that school's athletic program, see Northern Illinois Huskies. Northern Illinois is dominated by the metropolitan areas of Chicago, the Quad Cities, and Rockford, which contain a majority (over 75%) of Illinois' population and economic activity, including numerous Fortune 500 companies and a heavy manufacturing, commercial, retail, service, and office based economy. Much of the economic activity of the region is centered in the Chicago Loop, the Illinois Technology and Research Corridor, and the Golden Corridor. However, rural sections of this region are highly productive agriculturally, and are part of the Corn Belt. The headquarters for John Deere farming equipment are located in Moline. Additional smaller cities in this area include Kankakee, LaSalle- Peru, Ottawa, Freeport, Dixon, and Sterling- Rock Falls, which still have predominantly manufacturing and agricultural economies. Northern Illinois is also one of the world's busiest freight railroad and truck traffic corridors. Interstate 80 is sometimes referenced as the informal southern boundary of Northern Illinois, and is often used in weather reports as a reference point, as in "south of Interstate 80 will see sleet and rain, but north of Interstate 80 can expect mostly snow." Interstate 88 (the Ronald Reagan Memorial Tollway) connects the region, east-west, stretching from the Quad Cities, eastward through Sterling-Rock Falls, Dixon, DeKalb, Aurora, Naperville, and into Chicago. Northern Illinois is also the only region of the state in which there are tollways, which are run by the Illinois State Toll Highway Authority, another trait separating this region from Central and Southern Illinois. Northern Illinois University (NIU), in DeKalb, IL, is located at the heart of Northern Illinois and is the state's second largest institute of higher education. According to the Regional History Center at NIU, their area of service to the northern portion of Illinois includes the 18 northernmost counties, excluding Cook, Grundy, Kankakee, Mercer and Rock Island Counties,  which are covered by Eastern Illinois University and Western Illinois University, respectively, and University of Illinois at Chicago. Several major colleges can be found in the Chicago area including Illinois' third largest state school, the University of Illinois at Chicago, as well as the University of Chicago and Northwestern University. Other notable schools include the Illinois Institute of Technology, Loyola University, DePaul University, Columbia College, Northeastern Illinois University, and Roosevelt University. Several liberal arts schools such as Aurora University, Lewis University, North Central College, Elmhurst College, Wheaton College, Concordia University, and North Park University dot the Metropolitan Chicago landscape. Other institutions of higher education are found in Rockford, including Rockford University, Rock Valley College, Northern Illinois University-Rockford, University of Illinois College of Medicine-Rockford, a branch of Rasmussen College, and a branch of Judson University. Other colleges near the Quad Cities include Western Illinois University-Quad Cities and Augustana College. These schools, along with several others, help to make Northern Illinois a vibrant research area. Such significant developments in science including the creation of the Atomic Bomb and the Fujita Scale were rooted in Northern Illinois institutions. Politically, the region is quite diverse, with Cook County and Rock Island County being long-time strongholds for Democrats and north central Illinois counties ( Boone, Ogle, Lee, etc.) being reliable for Republicans. Suburban Chicago counties such as DuPage, Kane, Kendall and McHenry Counties were also very reliably Republican until recently. Some counties, such as Lake, Winnebago and DeKalb, were once Republican strongholds, but are now more evenly divided. Famous politicians native to the area include Ulysses S. Grant, Ronald Reagan, J. Dennis Hastert, Donald Rumsfeld, Hillary Clinton, and Mayors Richard J. Daley and Richard M. Daley. Culturally, the area is tied heavily to Chicago Most residents of Northern Illinois tend to root for Chicago teams and lean towards the Chicago media market. The major college football program in Northern Illinois is the NIU Huskies. Northern Illinois also has large fanbases for the Illinois Fighting Illini, Notre Dame Fighting Irish, Iowa Hawkeyes, and the Northwestern Wildcats. In Central and Southern Illinois, residents are tied primarily to St. Louis. Additionally, regional dialects in Northern Illinois vary from those in other parts of Illinois. Surprisingly, different areas in Northern Illinois have their own independent cultures. Typically, areas west of Interstate 39 have more ties to Iowa and the Quad Cities area, as that is roughly the location of the westernmost terminus of the Chicago media area. Even dialects within Northern Illinois are different, emphasizing the above. Depending on location and ethnicity, a resident of the Chicago Metropolitan Area may have the stereotypical Chicago dialect, whereas those in more affluent areas, such as Lake County, may have a less easily pinpointed manner of speaking. Those west of Chicago have more stereotypical Midwestern dialects, and might not be able to be distinguished from people in Iowa or Nebraska. Depending on how close to a specific metropolitan area a county is, their culture and media reflect that of the metro area. There are exceptions, however. McHenry County may sometimes be considered Chicago-influenced, and, at times, Rockford-influenced. Areas such as the Ottawa-Streator Micropolitan Statistical Area have a comfortable mix of culture from the Chicago area, Quad Cities area, and Peoria, perhaps being due to its location in the center of the region. Northern Illinois is divisible into subregions. The Chicago metropolitan area, or Chicagoland, is the metropolitan area associated with the city of Chicago, Illinois, and its suburbs. It is the area that is closely linked to the city through geographic, social, economic, and cultural ties. Chicago ( /ʃɪˈkɑːɡoʊ/ ( listen) or /ʃɪˈkɔːɡoʊ/) is the third most populous city in the United States, after New York City and Los Angeles. With 2.7 million residents,  it is the most populous city in both the U.S. state of Illinois and the American Midwest. Its metropolitan area, sometimes called Chicagoland, is home to 9.5 million people and is the third-largest in the United States. Chicago is the seat of Cook County, although a small part of the city extends into DuPage County. 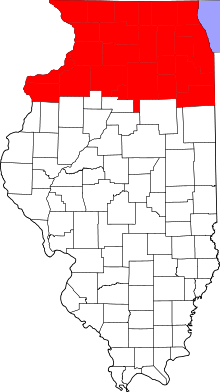 The collar counties are the five counties of Illinois that border on Chicago's Cook County. The collar counties ( DuPage, Kane, Lake, McHenry, and Will) are tied to Chicago economically, but, like many suburban areas in the United States, have very different political leanings than does the core city. Chicago has long been a Democratic stronghold, and the collar counties are known for being historically Republican strongholds. While the demographics of these suburban Chicago counties are fairly typical for American metropolitan areas, the term is apparently unique to this area. And because Chicago is so firmly entrenched in the Democratic column, and rural Downstate Illinois is so overwhelmingly Republican, the collar counties are routinely cited as being the key to any statewide election. However, that conventional wisdom was challenged by the fact that in 2010 Democrat Pat Quinn became governor while winning only Cook, St. Clair, Jackson and Alexander counties. All five collar counties went Republican, so the key to winning that gubernatorial election was simply winning Cook County, but by a wide enough margin to overwhelm the rest of the state. The Fox Valley—also commonly known as the Fox River Valley—is a rural, suburban, and exurban region within Illinois along the western edges of the Chicago metropolitan area. This region centers on the Fox River of Illinois and Wisconsin. Around 1 million people live in this area. Native American tribes that lived near the Fox River included the Potawatomi, Sac, and Fox tribes. Some of cities in the Fox River Valley are part of the rust belt. Within this region is Aurora, the second largest city in the state, Elgin, and the nearby cities of Batavia, St. Charles, and Geneva, which have been known as "the Tri-City area" since the early 20th century. Northwestern Illinois is generally considered to consist of the following area: Jo Daviess County, Carroll County, Whiteside County, Stephenson County, Winnebago County, Ogle County, and Lee County. Northwestern Illinois borders the states of Iowa to the west and Wisconsin to the north. The Rockford Metropolitan Statistical Area, as defined by the United States Census Bureau, is an area consisting of four counties in north-central Illinois, anchored by the city of Rockford. As of the 2010 census, the MSA had a population of 349,431. ^ "Regions of Illinois". Illinois Department of Natural Resources. Retrieved 4 October 2013. ^ "Illinois Regions". Illinois Environmental Protection Agency. Retrieved 4 October 2013. ^ "18 Northern Illinois Counties". Regional History Center. Northern Illinois University. Retrieved 4 October 2013. ^ "Annual Estimates of the Resident Population for Incorporated Places Over 50,000, Ranked by July 1, 2012 Population: April 1, 2010 to July 1, 2012". U.S. Census Bureau. May 2013. Retrieved 2013-12-05. ^ "Table 1. Annual Estimates of the Population of Metropolitan and Micropolitan Statistical Areas: April 1, 2010 to July 1, 2012". U.S. Census Bureau. March 2013. Archived from the original on April 1, 2013. Retrieved 2013-12-05. ^ "Collar Counties". Encyclopedia.chicagohistory.org. Retrieved 2013-12-18. ^ AC4508. "PSB: Progressive Illinois Politics:: The Collar County Shift". Prairiestateblue.com. Archived from the original on 2013-12-19. Retrieved 2013-12-18. ^ "Quinn-Brady race may be decided in collar counties". Chicago Sun-Times. Retrieved 2013-12-18. ^ "Why the Collar Counties are Trending GOP". NBC Chicago. Retrieved 13 September 2013. ^ "Ballots Cast". Illinois State Board of Elections. Retrieved 2013-12-18. ^ Mount, Charles (30 May 1989). "Collar Counties Cutting Court Backlogs". Chicago Tribune. Retrieved 13 September 2013. ^ "Collar County Homepage". Northern Illinois University. Retrieved 2013-12-18. ^ "Welcome to the Quad Cities". City Guide Post Inc. Retrieved February 2, 2008. ^ "Community Visitor Information". Illinois Quad Cites Chamber of Commerce. Archived from the original on December 14, 2007. Retrieved February 2, 2008. ^ Johnson, Dirk (October 20, 1987). "East Moline Journal; Friday Night High, in the Bleachers". The New York Times. Retrieved February 2, 2008. ^ "Cool Community". Quad Cities Chamber. ^ "Annual Estimates of the Population of Metropolitan and Micropolitan Statistical Areas: April 1, 2010 to July 1,". 2011 Population Estimates. United States Census Bureau, Population Division. June 2012. Archived from the original ( CSV) on April 27, 2012. Retrieved 2012-08-01. ^ "Annual Estimates of the Population of Metropolitan and Micropolitan Statistical Areas: April 1, 2010 to July 1, 2011" ( CSV). 2012 Population Estimates. United States Census Bureau, Population Division. April 2012. Retrieved 2013-03-16.